No fewer than five police cadets at the Nigeria Police Academy, Kano, and a civilian were killed on Sunday in an auto crash at Maraban-Gwanda, along Kano-Zaria Expressway. Three others were also said to have been injured, while one of the two vehicles involved in the crash, which happened around 8.30am, was burnt. It was learnt that the cadets were on holidays and travelling to their respective destinations when a Golf car ran into a bus conveying them. It was gathered by The Punch that officials of the Federal Road Safety Corps and some policemen rescued the survivors and took them to St Lukes Hospital, Wusasa, Zaria. A colleague of the deceased, Suhail Saulawa, shared the tragic news on his Twitter handle, @cadet_suhail. One of the deceased, according to his name tag, was identified as A.M. Bello, while Saulawa gave the names of three others simply as Ayisha, Dabiri and Yamad. He stated that Dabiri posted on Instagram a few hours before the incident, lamenting that the deceased was an advocate of better policing in the country. He wrote, “Surely, every soul shall taste the bitterness of death. 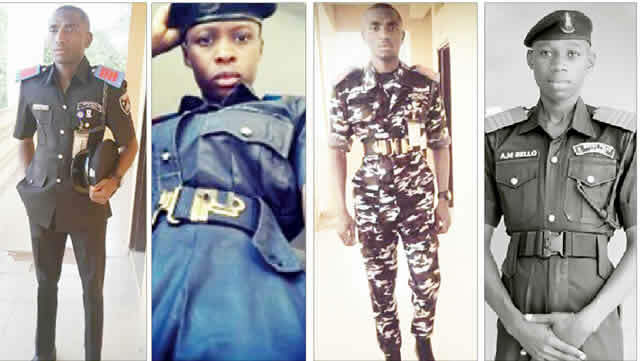 Today (Sunday), we lost four of our junior cadets on their way back home on break, along Kano-Zaria Expressway. “Dari, a highly reformed gentleman officer; his dream for better policing will never go in vain. We will continue from where you stopped #RIP, my gentle and loyal boy. See you in a better place. In another tweet update on the incident, Saulawa put the number of the deceased policemen at five. “We have lost the fifth cadet; may Allah bless and forgive his gentle soul,” he tweeted. The Corps Public Education Officer of the FRSC, Mr. Bisi Kazeem, who confirmed the crash, said the corpses of the victims had been handed over to their families. He said the corps received a distress call at 8.40am and mobilised its men to the scene immediately, adding that nine persons were involved in the crash. He said, “The accident was caused by speed violation; while two vehicles – a Ford transit white bus with the number plate, KMC 274 YW, and a black Volkswagen Golf – were involved. The number plate of the Golf car could not be ascertained because the whole vehicle was burnt. The Force Public Relations Officer, ACP Jimoh Moshood, said the Inspector-General of Police, Ibrahim Idris, commiserated with the families of the late cadets, adding that they (the families) had been informed about the incident through the commandant of the police academy. He said, “It was an unfortunate incident and everybody is sad. The commandant informed me this morning (Sunday). The Inspector-General of Police and the entire Nigeria Police Force commiserate with their families and colleagues.